We understand that it is very difficult to establish oneself as a bankable name in the industry, therefore our aim is to effectively serve our clients and cater to their varied needs. For earning the trust of our clients, we focus on their complete satisfaction. The company was established in 1998. We are specialized in manufacturing & exporting most advanced and perfect system for material handling equipments and is equipped with excellent and high class technology and practical experience of qualified technocrat. 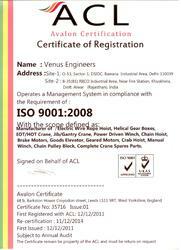 Venus Engineers is a well-know and an established manufacture and exporter of material handling and lifting equipments. Our products range includes Double Girder I-Beam Crane, Single Girder I-Beam Crane, Gear Coupling, Bottom Hook Assembly, Wheel Assembly, Overhead EOT crane, Wall Mounting Jib Crane, Pillar Mounting Jib Crane, Electric Power Winch Machine, Manual Chain Hoists, Electric Crab Trolley, Helical Gear Boxes, Electric Geared Motor, Traction Elevator and Freight Elevators. 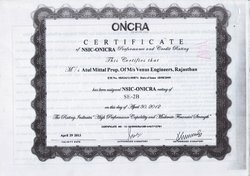 The head office of our company is located Rajasthan, India. Material handling is an important and integral part of industry. Where lifting and shifting or lowering of materials take place constantly. We have confidence in offering outstanding products, additional good service and in time delivery. Venus engineer's cranes have the unique virtues of less wheel load, less weight and extremely low failure rate. They are the most ideal and economic upgrading products for traditional lifting equipments. Our products are used in a wide array of industries right from Infrastructure to hospitals and schools. Our product range is extremely generic and we ensure that we design it to specific standards, so that our clientele can enjoy all the possible options they need to automate their material handling systems. We have clients from the field of pharma, textiles, infrastructure and many other realms of operations. Our products are renowned for the excellent performance under stressful conditions. This is solely due to their excellence in qualitative parameters. Our state of the art and technologically advanced manufacturing facility is equipped with the latest machines and equipment to facilitate both the design as well as the production process. We are further expanding our existing capacity, due to the extensive demands from our customers and are building a much stronger infrastructure on the lines of international standards.Using the latest technological trends we have developed some of the most highly effective infrastructure possible. With each division ensuring that the quality received from the previous division is perfect. Our focus is on customization. Since our products are of such nature, that generic products rarely sell. In the field of material handling, customization is the king. Due to various constraints like, size, space, price or others, one always needs customization. We have become such reliable suppliers specifically because of this trait of ours. Our belief in long term relationships with our clients have ensured that we do not have the "get-rich-quick" disease, we charge a fair price for our services and products. Having said that, you would find that our products are surprisingly cheap and cost effective. Since 1998, we have endeavored to ensure that every product we produce and every service we deliver are as close to perfection as possible. Our team is our support system for our company that is why we are always in a strong position to meet with the client's requirements. A team is the core component in any organization's success. With members from designing, production, packaging, dispatch,procurement and Ancillary functions like admin and HR contributing, our success is guaranteed. Our team has ensured that they leave no stone unturned in ensuring that the company achieves the pinnacle of success. The utmost care is taken by us to maintain a fair and healthy environment among the workers. We respect every individual idea and take proper care so the team members enjoy their work and give their best in their respective activities. With us we have engineers, production managers, quality analysts, supervisors and other skilled workmen. We are assisted by professionals for designing, engineering, implementing and even consulting with clients.